We have a new look! Today PCWorld.com unveils a fresh homepage design, with a clean, contemporary look, simplified navigation, and quick access to the hand-picked stories of the day. 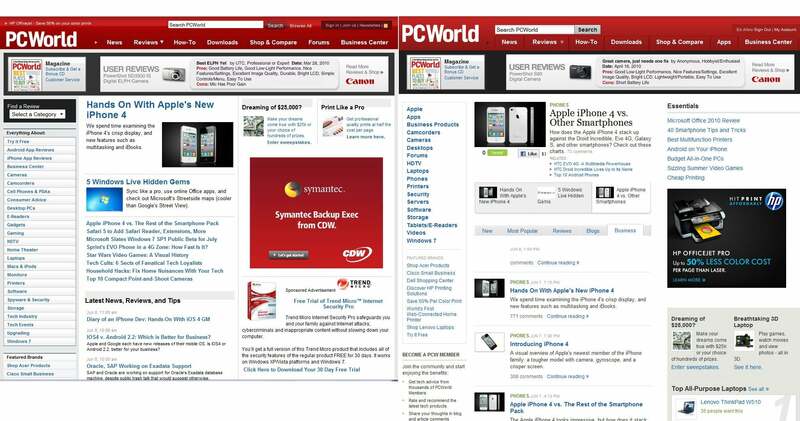 The old PCWorld homepage layout (left), and the new streamlined design. The most obvious revamp appears squarely atop the center column, where we now display a carousel of three articles chosen by our editors--anything from breaking news stories to up-to-the-minute reviews to entertaining slideshows. Each signature story includes a listing of related content to help you explore the topic further, along with a simple way to share the stories on Twitter and Facebook. Just below the top stories, tabbed columns make it easier to find information in five categories: New, Most Popular, Reviews, Blogs, and Business. There you'll find a steady stream of new articles, updated minute-to-minute. The default view is "New," displaying a feed of the day's latest content, with the most recent stories at the top. Want to see just our latest blog entries? Click the Blogs tab. Other tabs will take you to reviews, Business Center articles, and so on. Shifting your eyes westward, you'll see that the left-hand navigation bar--previously jam-packed with 25 or so pointers to topics, products, and other index pages--now sports a groomed selection of editorial topics that most readers are looking for. As before, you can still reach major sections of the site by using the top-line menu items contained in the red PCWorld bar atop the page. There's so much news in technology every day that important stories quickly cycle off the homepage in favor of newer items. In response, we've created the Essentials section in the upper-right corner of the redesigned page, where you'll find significant articles and reports--like a review of the latest Microsoft Office or a list of ingenious smartphone tips--that are as useful today as they were the day we published them. It's not just a static listing of greatest hits, however: We'll update Essentials daily, so check there for a fresh serving of valuable evergreen content every day. There's more, but we leave it to you to explore. Love it? Hate it? Have other suggestions? Tell us what you think in the Comments. We look forward to your feedback.